Plan of Improvements of the Battery. 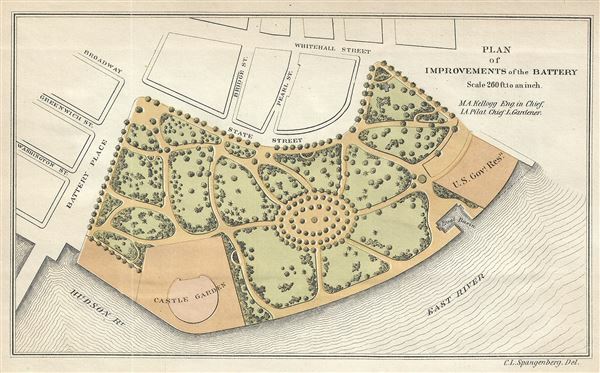 This is a scarce 1817 map of the Battery Park by Kellogg and Pilat. Located on the southern tip of Manhattan, Capske Hook or the Battery, as it was later called, was where the Dutch began their settlement of New Amsterdam (now New York) in 1625. The Battery was so named because of the gun 'batteries' constructed around the shore to protect the city in 1683. Over the years, this popular promenade with magnificent views of the harbor was enlarged through landfill and the old fort (Fort Amsterdam, later called Fort George) was demolished with Castle Clinton (also called West Battery Castle Garden at different times) taking its place. When this plan was made, Castle Garden, as it was then known, was America's first immigration station predating Ellis Island, welcoming millions of immigrant from foreign lands. The Castle would later be turned into an aquarium and is now a National Monument. Battery park, along with the rest of the city, has expanded over the decades to what is today an invaluable part of new York City's history. This plan for its improvement was created by Parks Engineer in Chief M. A. Kellogg and Chief Landscape Gardener I. A. Pilat for the First Annual Report of the Board of Commissioners of the Department of Public Parks for the Year Ending May 1, 1871. Maps of Battery Park are exceptionally scarce, making this a rare find and an important addition to any serious collection focusing on New York City.